From Chatterton's Pre-Raphaelite demise to Keats' death warrant in a smudge of arterial blood; from Dylan Thomas's eighteen straight whiskies to Sylvia Plath's desperate suicide in the gas oven of her Primrose Hill kitchen or John Berryman's leap from a bridge onto the frozen Mississippi, the deaths of poets have often cast a backward shadow on their work. The post-Romantic myth of the dissolute drunken poet - exemplified by Thomas and made iconic by his death in New York - has fatally skewed the image of poets in our culture. Novelists can be stable, savvy, politically adept and in control, but poets should be melancholic, doomed and self-destructive. Is this just a myth, or is there some essential truth behind it: that great poems only come when a poet's life is pushed right to an emotional knife-edge of acceptability, safety, security? What is the price of poetry? 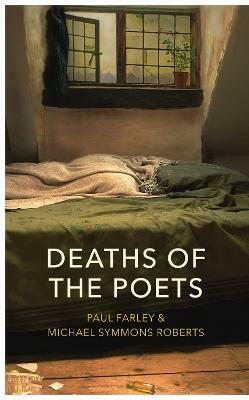 In this book, two contemporary poets undertake a series of journeys - across Britain, America and Europe - to the death places of poets of the past, in part as pilgrims, honouring inspirational writers, but also as investigators, interrogating the myth. The result is a book that is, in turn, enlightening and provocative, eye-wateringly funny and powerfully moving. "So much material of such innate interest is presented with just the right balance of panache, wit, insight and elegy… A good, clever, kindly and enjoyable book it is, like eavesdropping on two smarter friends when they are sparking off each other… Farley and Roberts are always entertaining and illuminating, gentle guides and quixotic questers." Michael Symmons Roberts (Author) Michael Symmons Roberts was born in Preston, Lancashire in 1963. He has published six collections of poetry and received a number of accolades including the Forward Prize, the Costa Poetry Award and the Whitbread Poetry Prize. As a librettist, his work has been performed in concert halls and opera houses around the world. An award-winning broadcaster and dramatist, he has published two novels, and is Professor of Poetry at Manchester Metropolitan University. He is a Fellow of the Royal Society of Literature.Paul Farley (Author) Paul Farley is the author of four collections of poetry and has won the Forward Prize for Best First Collection, the Whitbread Poetry Award and the E.M. Forster Award. He broadcasts regularly on radio and presents The Echo Chamber on Radio 4. Edgelands, co-written with Michael Symmons Roberts, received the Royal Society of Literature's Jerwood Award and the 2011 Foyles Best Book of Ideas Award and was serialised as Radio 4 Book of the Week.